At Loveland Veterinary Clinic, we have over 52 years of combined experience to handle the almost any kind of problem or concern you may have with your pet. From preventative health measures, such as vaccines and wellness check, spays and neuters to complicated medical or surgical procedures, you can be confident we will have you and your pet’s best interest in mind. We offer state of the art laser therapy and dental procedures, and well as x-rays, blood work, ultrasound to manage almost any medical or diagnostic need. 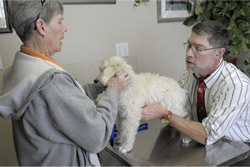 For those cases we feel you would be better served referred to a specialist, we have developed great working relationships with area ophthalmologists, dermatologists, radiologists, orthopedic and soft tissue surgeons, reproductive specialists and cardiologists to make sure you and your pet get you the care you need. At Loveland Veterinary Clinic, you can be assured we take the utmost care to serve our clients and patients in a way we would like to be treated. We take our vision and mission seriously and we strive to constantly maintain an attitude of service and consider it an honor that you have chosen us as your veterinary clinic.